This premium Grade 1 Peruvian coffee is not one to miss for any coffee lovers. Flavours of sugar cane, plum apple paired with a round body and bright acidity create a delicious cup that is certainly moreish. The nutty notes make this a subtly sweet cup, and is ideal for those who don’t want sweetness that is overwhelming. We roast these beans to a medium level to enhance these delightful flavours and create an exquisite cup. Peru is known for its high quality beans, and the San Martin G1 is no exception. G1 (grade 1) is the highest grade a coffee can achieve, and we are proud to stock such a premium product at Adams + Russell. Fair trade isn’t just about a fair wage and better working conditions, it’s so much more than that. It provides a stable income to support families, allows local businesses to thrive and promotes sustainable farming practices to build a brighter future. This plantation is also part of the APRYSA Cooperative, which helps farmers gain better resources, materials, land, training and business opportunities. Peruvian coffee beans – what exactly does G1 mean? G1, also known as Grade 1 or Specialty Grade Coffee are some of the highest quality beans that you can purchase. They are graded by many factors, one including the defects. Coffee Research tells us that G1 has no primary defects and 0 – 3 full defects. Showcases a distinct attribute in one of these areas: taste, acidity, body, or aroma. Peru Coffee Farms – where and how are these beans produced? This single plantation product is grown in Rodríguez de Mendoza Province, which is located in the southeast part of the Amazonas, North Peru. The beans grown here are part of the APRYSA Cooperative. A coffee cooperative is a group of farmers and producers who work together to gain better resources, materials, land, seek out better business opportunities and provide more training. It is a team working together to produce better quality produce and better opportunities for the community. In Rodriguez de Mendoza, there are 257 members located across the 11 districts. 828.95 hectares of land is dedicated to coffee production, and the harvesting conditions benefit from elevations of 1400 to 1900 metres above sea level. These high elevations only contribute more to the premium quality of the beans. This is because high elevations slow down the maturity rate of the cherry, which enhances the complex sugars and delicious sweetness. The beans are pulped, fermented and dried at the farm level. Parchment is delivered to the dry mill and prepared for export by Perunor (the exporting company). Where are the best places to buy Peru coffee? Peruvian beans are known for their gentle, flavourful and aromatic qualities. Our roasting experts recommend any coffee lover to taste a fresh cup to discover why they’re so widely appreciated. To ensure you are receiving authentic Grade 1 Peruvian beans, always buy from a trusted supplier. 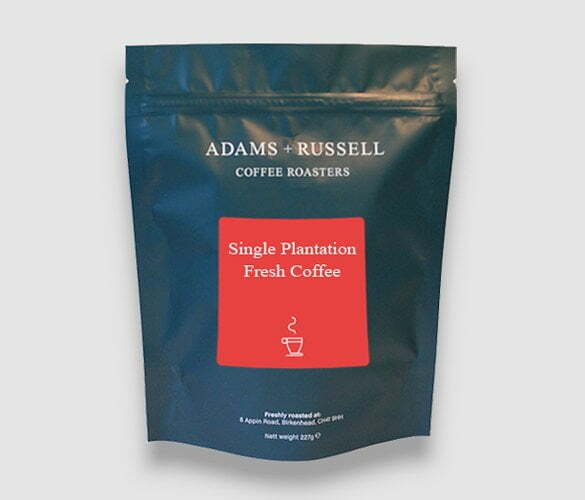 At Adams + Russell we hand roast in small batches every day to ensure the coffee is as fresh as possible when it arrives at your front door. Browse our full range of coffees to explore our different origins and to see what offers we have available. I struggled to pick any of the suggested taste notes, so a bit of disappointment.